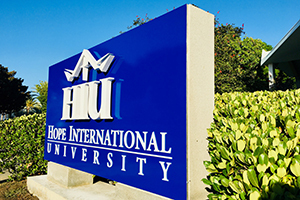 Hope International University draws scholars from around the world who are committed to excellence. In our mission of empowering students through Christian higher education to serve the Church and impact the world for Christ, we invite our friends and supporters- individuals, corporations, foundations, and other patrons of education – to join us in building on this foundation of excellence. Whatever your motivation for giving to Hope International University – whether as an Alumni you are grateful for your experience and want to give something back, or you wish to leave a legacy to benefit generations to come – you’ll find many ways to make a significant, lasting difference in the lives of people. The investment you make in the students at HIU pays dividends over the course of each graduate’s lifetime. For some, the returns take the form of changes in public and private education or in the for-profit and non-profit business arena. For others, returns are seen in the counseling, social services and public service professions.